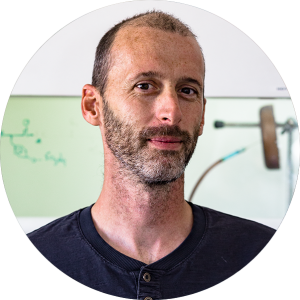 Pascal Verdié, a chemical engineer from the Ecole Nationale Supérieure de Chimie of Montpellier, France, performed a PhD program in Chemistry and Biology Sciences for Health, Montpellier University, which he graduated from in 2005. He worked on the development of selective ligands for the α-MSH MC1 receptor by the means of a huge program of peptide and combinatorial chemistry. Pascal received a Research Associate position at Montpellier University since 2005. He’s in charge of the SynBio3 platform dedicated to assist the development of research programs in life science providing biomolecules and polymers of biological and pharmaceutical interest. He succeeded in obtaining the IBISA label since January 2013 and in achieving ISO 9001 certification in 2015. «Systemic Delivery of Tumor-Targeted Bax-Derived Membrane-Active Peptides for the Treatment of Melanoma Tumors in aHumanized SCID Mouse Model» A Karageorgis, M Claron, R Jugé, C Aspord, F Thoreau, C Leloup, J Kucharczak, J Plumas, M Henry, A Hurbin, P Verdié, J Martinez, G Subra, P Dumy, D Boturyn, A Aouacheria, and JL Coll1. Molecular Therapy, Molecular Therapy, 2017, 25, 2. «Sol-gel synthesis of collagen-inspired peptide hydrogel», Echalier, S. Jebors, G. Laconde, L. Brunel, P. Verdie, L. Causse, A. Bethry, B. Legrand, H. Van Den Berghe, X. Garric, D. Noe, J. Martinez, A. Mehdi and G. Subra, Materials Today, 2017, 20, 2. «Pharmacological and Biochemical Characterization of TLQP-21 Activation of a Binding Site on CHO» Molteni, L. Rizzi1, E. Bresciani1, R. Possenti, P. Petrocchi Passeri, C. Ghè, G. Muccioli, J-A Fehrentz, P. Verdié, J. Martinez, R.J. Omeljaniuk, G. Biagini, A. Binda, I. Rivolta, V. Locatelli1 and A. Torsello, Frontiers in Pharmacology, 2017, 8. «Agonism, antagonism and inverse agonism bias at the Ghrelin receptor signaling» C M’Kadmi, J-P Leyris, L Onfroy, C Galés, A Saulière¶, D Gagne, M Damian, S Mary, M Maingot, S Denoyelle, P Verdié, J-A Fehrentz, J Martinez, J-L Banères, J Marie Journal of biological Chemistry, 2015, 290(45), 27021-27039. «Ghrelin Receptor Ligands: Design and Synthesis of Pseudopeptides and Peptidomimetics » Moulin, A. Brunel, L. Verdie, P. Gavara, L. Martinez, J and Fehrentz, J-A. Current Chemical Biology, 2014, 7 (3), 254-270.